1. Check the ratings: This may be obvious, but the ratings of movies are decided based on the content. Usually, the ratings will share details such as language, adult content, or violence, yet you can find out more specifics by just doing a bit of research. Search the specific show or movie and find out exactly why it was rated that way; you can then decide if it’s appropriate for your children. 2. Keep the generation in mind: Content in TV shows or movies isn’t the same as it was when you were growing up. Something that was rated R years ago is probably now only considered PG-13, so look at the content and choose what you want to ease your kids into seeing and hearing first. 3. Reiterate that what happens on screen isn’t reality: Kids have wild imaginations, so you have to be careful of what they watch. Remind them that the things they see on screen don’t equate to what happens in real life and it is just for public entertainment. Also, as a parent, explain concepts that they might not fully understand yet. It’s better if it comes from you rather than a stranger. 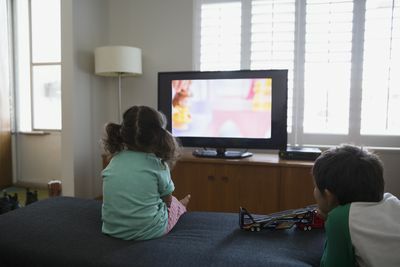 What is some parenting advice on how to decide which TV shows and movies your kids are allowed to watch? Let us know below!